Breed Group: Working Weight: 70 kgs Height: 70 cms Color(s): fawn, apricot, or brindle, all with dark muzzle, ears and nose Coat: The Mastiff is a double coat breed. The outer coat is short, coarse, and straight. The under coat is dense and fits closely to the body. The nose, muzzle, and ears are black. Distinct feature: A massive, muscular, and powerful dog, the Mastiff is one of the heaviest of breeds. 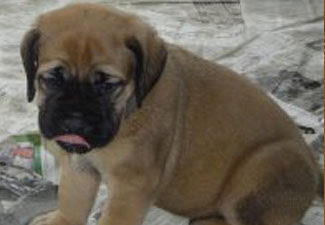 Mastiffs are fearless, alert, and extremely courageous. Temperament: The Mastiff is a watchful, reliable, and intelligent breed. They are exceedingly loyal and deeply devoted to their family. This breed thrives on human companionship and affection .The Mastiff does best in a home with older considerate children. They do not do well with other household pets they have not been raised with. This breed is naturally protective and is extremely possessive of their family and home. Activity: Daily securely leashed walks or a play session in a safely fenced small yard are highly recommended to keep them happy and fit. They will do okay in an apartment or condominium dwelling provided they are given stimulation, attention, and sufficient exercise.